"Lemon juice combines with mild rice vinegar in a dressing that's both sprightly and slightly sweet to dress young, tender lettuces." Combine shallot, honey, mustard, and salt in a jar with a lid; add olive oil, lemon juice, and vinegar. Cover jar with lid and shake until dressing is thickened. Place arugula in a bowl and drizzle dressing over greens; toss to coat. You can make a larger batch of dressing by simply doubling or tripling the amounts and store it in the fridge for a week or two. This dressing can also do double duty as a marinade for chicken or thick, firm-fleshed fish. 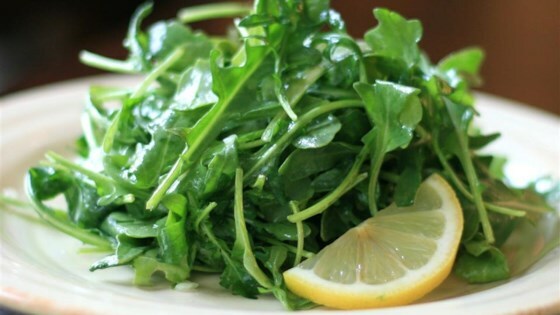 Any variety of spring lettuce such as Bibb or red leaf can replace the arugula. A little sour for me. Have a lot of arugula growing in my garden. The honey mustard vinaigrette goes perfectly with it. Thank you for sharing the recipe! Loved this salad and plan on making it all summer long! Great favorite at my party!